The idea was fraught with uncertainty. Move 72 low-income apartments out of the Lumber River floodplain before the next big storm. It was late 2016, and Adrian Lowery, executive director of the public housing authority in Lumberton, N.C., knew the clock was ticking on Hilton Heights and Myers Park, two of the city's most flood-prone housing projects. Both had been badly damaged by Hurricane Matthew months earlier. The question was not whether to rebuild the ruined units, but where? And who would pay for it? Now, as the city stares down its second flood crisis in as many years following Hurricane Florence, Lowery is even more convinced that the city's low-income residents need more than a temporary housing voucher. "We want to get our residents out of harm's way," Lowery said last week. "We want the opportunity to rebuild out of the floodplain." For flood-battered communities across the United States, moving up and out of the floodplain, what planners call "strategic retreat," is a rising need. Risk profiles for both coastal and riverine municipalities are growing more dire. Houston suffered billions of dollars in damages during Hurricane Harvey last year. The Carolinas are still reeling from Florence, which damaged or destroyed an estimated 600,000 homes or more. 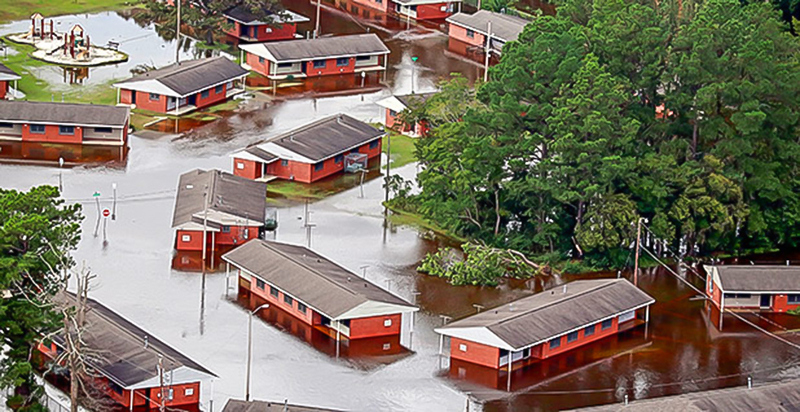 According to the Furman Center at New York University, roughly 10 percent of North Carolina's public housing — which serves low- and moderate-income families — lies within the 100- or 500-year floodplain. That's thousands of units. Numerous studies have shown that the poor face much higher risk of losing lives and property from floods (Climatewire, Oct. 1). Lumberton is trying to buck that trend. With a mix of federal, state and local support, the housing authority hopes to begin tearing down and rebuilding Hilton Heights and Myers Park within the next 12 months. If successful, it would be the first public housing community in the state to be physically relocated to adapt to flood risk. But as with other vexing issues involving the nation's poor, it could take years to complete the Lumberton projects. That's because financial, economic and even cultural barriers are working against efforts to provide shelter to low-income residents. That's true in communities like Lumberton that have traditionally been havens for the economically distressed. Some of the obstacles can be overcome with careful planning — such as finding high ground that meets city and county zoning requirements. Others are more intrinsic and steeped in long-held assumptions about public housing, the poor and race. "This county has a lot of land that has been in families for a long period of time," Lowery said. "You hear the word 'public housing,' and it has a negative connotation. Some people think, 'Oh, man, do we really want more public housing in this area?'" Housing advocates say that unless flood-ravaged communities like Lumberton can secure the resources to stabilize thousands of low-income residents who have been scattered by recent storms, the strain on other public services — from education and job training to transportation and health care — will grow exponentially. "When you lose a large portion of your [low-income] housing, you also risk losing many of the community assets that come with it," said Laurie Schoeman, senior program director for resilience initiatives at Enterprise Community Partners, which helps low-income people withstand extreme weather events. "If you can't get to a safe, inhabitable place after a major disaster, it is very difficult to sustain life," Schoeman said. People in Robeson County, N.C., know what it feels like to have their lives nearly snuffed out. Since October 2016, when Hurricane Matthew plowed through the state, causing an estimated $5 billion in damage, residents of Lumberton and its neighboring towns have struggled to regain a sense of balance. An action plan by the North Carolina Department of Commerce, updated in April, noted that a disproportionate number of low- and moderate-income renters in Lumberton sustained damage from Matthew. The storm displaced 264 families — all from the city's public housing facilities. Hundreds of additional low-income families may have been forced out of privately managed housing, officials say. Among them was 60-year-old Barbara Brown, whose Lumberton Housing Authority apartment was destroyed by Matthew. She's still feeling the economic, mental and emotional toll of the storm. "Every time I think about it, my heart skips two beats," she said in a phone interview. "It left me with anxiety. It left me with depression. I'm still not past it." Like many of her neighbors, Brown spent nearly seven months living in a Federal Emergency Management Agency-paid hotel room hundreds of miles from Lumberton before moving back in April 2017. Today, she lives in a higher-elevation public housing community called Eastwood Terrace. Hundreds of her former neighbors have not been so fortunate. "I know some people that moved back and got flooded again," Brown said. Many more did not come back. Some couldn't find a job, a home or a friend to take them in. "A lot of people cannot afford outside of the [public housing] complex, so they don't have no choice. They don't have no choice until something comes up that is on higher ground," she said. That's where the authority's rehabilitation and reconstruction efforts are focused. In addition to relocating two buildings, the authority is restoring a third public housing complex that was badly flooded by Matthew. It's called Weaver Court. It escaped the worst of Florence, but five units did receive "minimal water," according to Lowery. The restoration will cost an estimated $1 million. Meanwhile, much of the prep work at Hilton Heights and Myers Park has been completed before demolition. The apartments were gutted, and the brick-on-slab buildings that used to house dozens of families stand empty, waiting for the wrecking ball. In the case of Hilton Heights, the housing authority has located a potential relocation site about 4 miles away on the east side of town. It's a 40-acre parcel of undeveloped land within walking distance of a Dollar General, a Food Lion and a Sun-Do gas station. The owner is willing to sell. Now comes the hard part: waiting for federal, state and local bureaucracies to sign off on what is estimated to be an $8.8 million rebuild of Hilton Heights. "We simply don't have enough money to rebuild all the units that were damaged by Matthew," Lowery said, "so we have to get creative." For a community like Lumberton, where 35 percent of residents live below the federal poverty line, that means scratching for every public dollar it can find. Since Hurricane Matthew, the two federal agencies tasked with overseeing the lion's share of federal recovery aid — the Federal Emergency Management Agency and the Department of Housing and Urban Development — have pledged roughly a half-billion dollars to help North Carolina victims. Much of that money comes from two programs — FEMA's Hazard Mitigation Grant Program and HUD's Community Development Block Grant Disaster Recovery program — and is awarded based on damage assessments submitted by local governments to the North Carolina Department of Public Safety. Keith Acree, a spokesman for the state Department of Public Safety's emergency management division, which administers the FEMA and HUD funds, said officials have reviewed the Lumberton proposal to relocate Hilton Heights and Myers Park and are supportive of the effort. "One of our priorities here at NCEM is to help increase the portfolio of affordable housing, particularly in the eastern part of the state, and to make the housing we already have more resilient to future storms, particularly hurricanes and floods," he said. Lumberton is in line to receive about $7.5 million of an initial $236 million Community Development Block Grant for Matthew recovery, Acree said, but none of that funding has materialized yet. The Lumberton Housing Authority also hopes to reap about $2 million in FEMA hazard mitigation grants and could see as much as $850,000 in insurance payments from units damaged by Matthew, according to Lowery. But even with those three funding sources, it's still not enough to meet the reconstruction cost of Hilton Heights and its 42 units. "It's also going to put us in a bit of a dilemma with Myers Park," Lowery said. The projected reconstruction cost for those 30 units is $4.8 million. "That's where we hope we'll be able to go back to the emergency management people and ask them to take another look at our situation," he said. "Florence has been like gasoline to a smoldering little fire." For now, all Lowery can do is wait while the list of applicants seeking low-income apartments stretches longer in the aftermath of Florence. Last week, the authority's waiting list had 559 people on it. "It gets longer every day," Lowery said. "You could say the economics of supply and demand are on full display in Lumberton."